This PhD work deals with the replication of particular natural structures, because they are multiscale and multifunctional. One of these structures are wings of Morphos butterflies, which are big tropical butterflies with a surprising blue coloration. The wing structure is composed of different structures at different scales (from cm to nm) and to each scales correspond a property or function (superhydrophobicity, coloration a priori without pigment). To make such multiscale and multifunctional structures is interesting and still difficult with our current nanofabrication techniques. 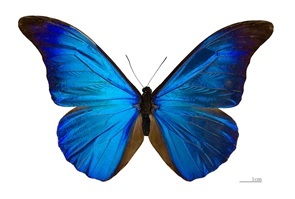 In this PhD work, we propose 3 replication methods to make replica of Morpho wings : the sol-gel method, a physical vapour deposition method and a mineralisation of the organic structure inspired by biomineralisation processes.